How did it go? Does your little sweater have a body now? You should have a nice little tank top that looks like the one below and today we're going to add cozy sleeves. If you need to catch up or read other parts of the knit along you can find them here: Intro, Supply List, Day 1, Day 2, Day 3. We'll be starting with Color A and we'll need our double-pointed needles in the size 8 to start. We captured the sleeve stitches on the waste yarn or a stitch holder. We're going to untie this, slip the stitches on to the needles and get knitting! 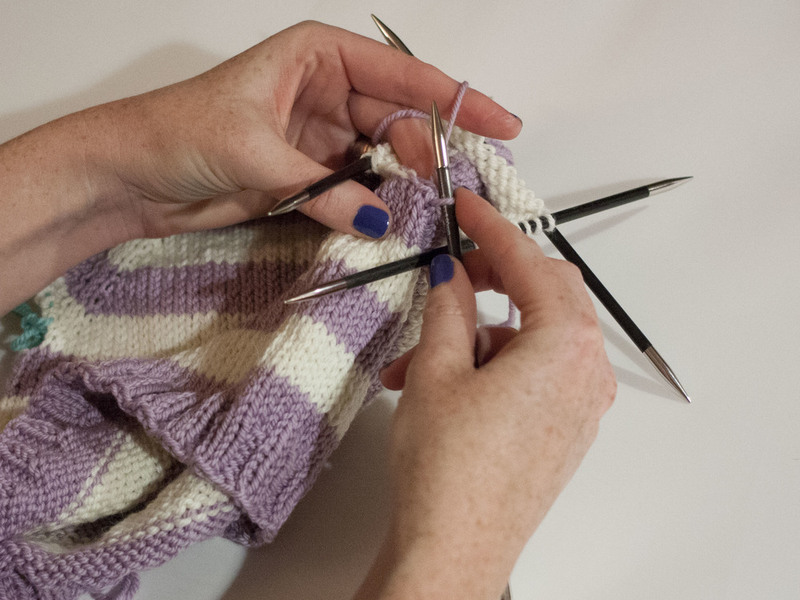 Begin at the underarm and carefully slip the needle into the stitches one at a time. Keep the waste yarn in the stitches during this step just in case you miss one or want to go back and rearrange some stitches. Think of it as a little lifeline! Move around the stitches dividing them up evenly on to three needles. The 6 month size as 30 stitches at this step so I'm putting 10 stitches on each needle. Here's what it looks like, but wait... I got to the end and I didn't have enough stitches. I totally missed one that should have been on the second needle! Luckily my little lifeline was there and I just pulled back the stitches from that needle, captured the one I missed, shifted some things around and, phew! 30 stitches on my needles. Count your stitches. Look around the edges, make sure you have the correct number for your size. Because now we pull out the thread! Ok! Now with Color A we need to pick up two stitches from the underarm area. Find a nice secure spot a little bit down from the edge. Insert your new needle through the knitted fabric, wrap your new working yarn around the needle and pull the loop through the fabric and onto your needle. Pick up a second stitch a bit to the left of the first. When your two stitches are picked up continue knitting with Color A across your first needle. Continue around the remaining two needles. Pick up two more stitches with the third needle. Now Round 1 is done! We are back to working in the round! You can put a marker on the needle if you choose. Continue knitting in the round down the sleeve. Remember to change colors to match the stripes on the body. Carry your yarn up the inside and don't forget to change to the smaller double-pointed needles when you get to the cuff! Work the second sleeve in the same manner. I learned a really great tutorial on avoiding an unsightly jog when knitting with stripes. I posted it here and you might want to check it out! I will see you again at 10 am Eastern on Tuesday for finishing and blocking our sweaters! Keep posting pictures on Instagram and Twitter with the hashtag #EasyAsABCKAL. I love to see them! If you have a question you can ask it in the comments here or in the Ravelry group. Email me if you want, heather@eweewe.com. KAL parts: Intro, Supply List, Day 1, Day 2, Day 3.